Today I’m posting something a little different. It was successful, but the success was spread out over a half dozen projects so I don’t have enough content for a single “The Making of” post. I used to work on several projects simultaneously with great success, but this week I learned it’s a method that no longer works for me. I like being focused on a single costume, things get done so much faster, my studio stays cleaner, and at the end of a week I not only feel like I accomplished something, but I have visual proof too. I’ve decided to pack a few of these projects away for the time being, and focus on finishing them one at a time, because right now i’m really overwhelmed. Even though these projects are going to be set aside for a few weeks, I have every intention of finishing them all. So I thought I would create a post about whats in my workroom, with a few teaser pictures of projects to come, as well as some photos of things I’ve finished but didn’t document well enough to blog about. Depending on how well this goes, I may do something similar monthly or bi-monthly with teasers, sketches, recent purchases, and life updates all crammed into one. The project i’ve had going on for the longest is a set of stays. I started these over six weeks ago and got them over 50% done, but haven’t managed to finish them off. They have all the bones in place, bound edges, and eyelets, but none of the pieces are together just yet. Once I get the stays finished off (which at this rate, won’t be happening anytime soon) I’d like to being work on a Robe a L’anglaise. 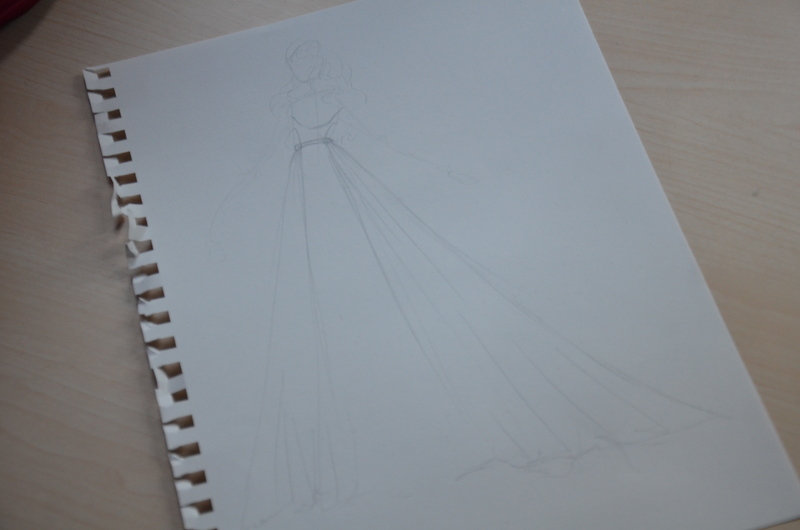 I already have the bodice drafted and the underskirt cut out, so technically this is in progress, but I need to buy some ribbon and organza before I can properly get to work. Sticking to the 18th century theme, a project I recently finished is a set of pocket hoops to go with my Dewdrop Series dress. These were more challenging then I had expected but I really love the end result! 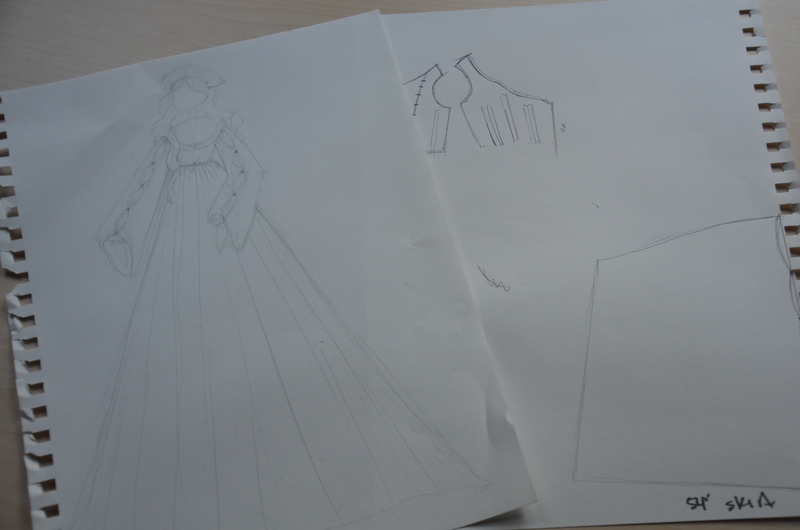 I drafted the pattern myself but referenced Norah Waughs “Corsets and Crinolines” book to get an idea of the shapes. These were made from cotton with hooping wire to keep the shape. 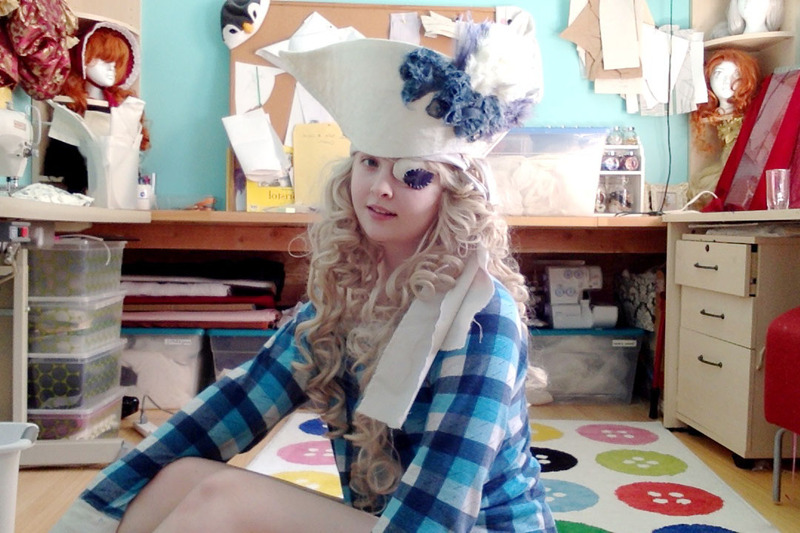 Another thing I finished was a hat and eyepatch! These were made to go with my Pretty Pirate costume. I started on these last October, but the weather became too cold to photograph the costume, so I lost the drive to actually finish it until now. The hat is made from felt weight interfacing, covered in a cream brocade, with a satin faced lining. The edges are bound in ivory linen and the whole thing is decorated with feathers and a chiffon applique. 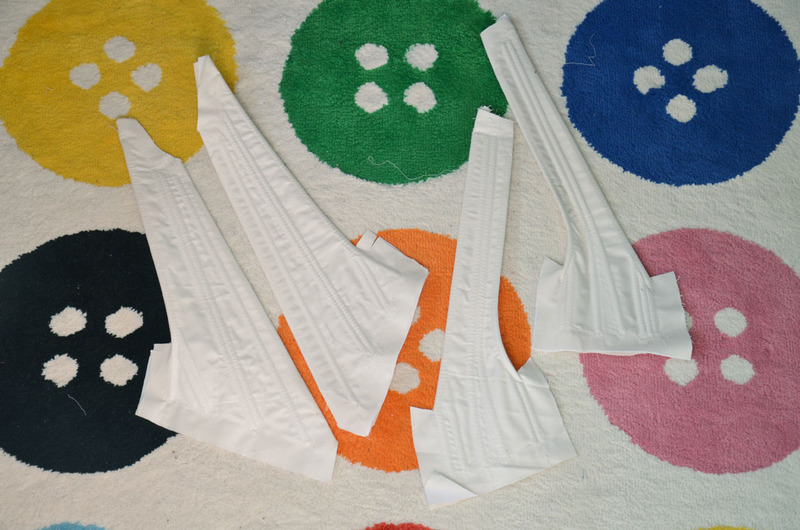 The eyepatch is made from heavy interfacing as well, and covered in the same fabrics. My most challenging work in progress, and the one i’ve chosen to focus on for the time being is re creating the painting Joanna of Aragon by Raphael I’m making a few changes to improve it’s appearance in real life, like using off white materials and lighter gold tones to give the appearance of age. But for the most part i’m trying to make it recognizable. I’ve gotten quite a lot done, including the most difficult aspect – the very detailed, hand beaded and embroidered collar! A project that I will definitely be packing away is this tulle and lace wedding gown idea. 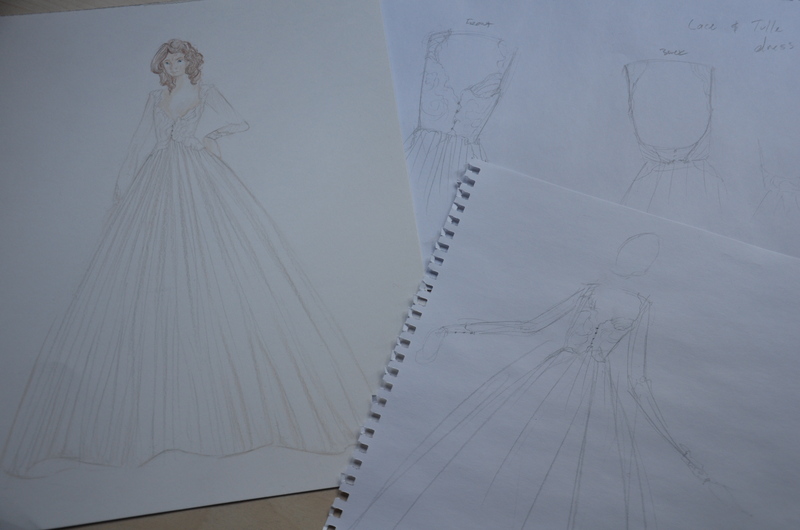 I actually began drafting this pattern a few weeks ago, but set it aside when I was asked to design the dress collection. I’ve worked on it a bit throughout the last week, including cutting out the bodice and getting half the boning channels done. There is still just a ton to do, and it will take so much space to make that I think this is best left alone until I have a cleaner workroom! The lace was actually sent to me as a gift and I really, really, adore it. 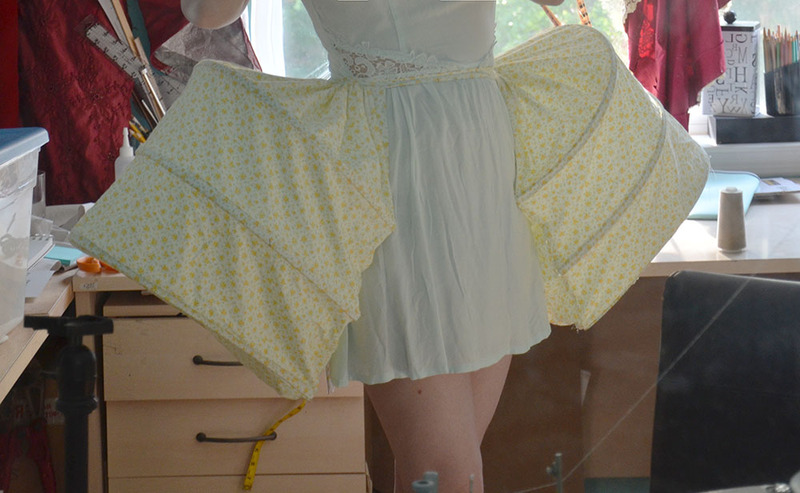 Whenever I Get around to making this it will be the real focus of the dress. 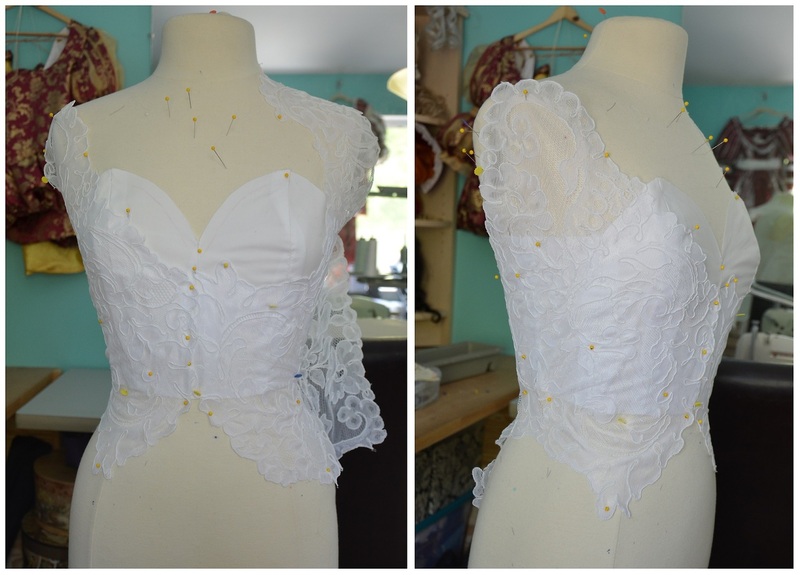 A few days ago I began work on a companion piece to my Dewdrop dress. I wanted to make a similar, more modern design from my left over fabric. It would have a lot of similar traits to the original, but be much sleeker in cut and style. So far all i’ve done is draft the pattern – and i’m not sure if it will ever move beyond that. 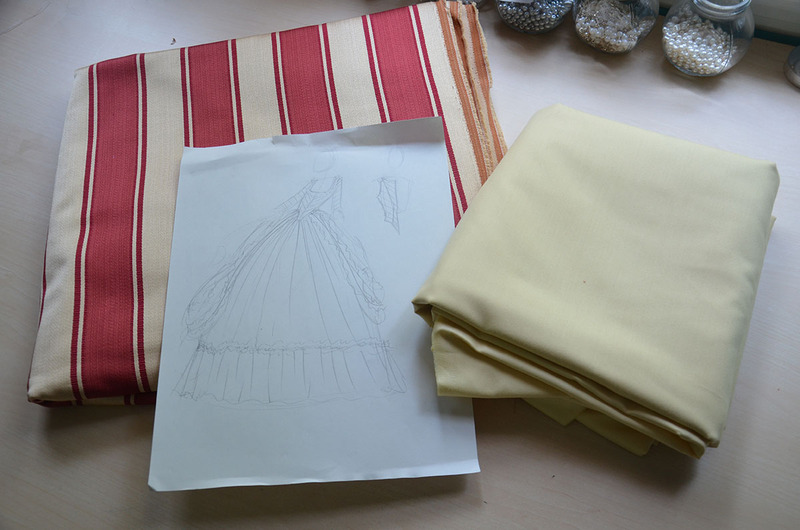 My last W.I.P is an empire waisted Regency gown. It’s made from bridal satin and chiffon, with gold lace and ivory pearls to create details. It’s a much less elaborate version of something I would like to make in the future, I guess you could say it’s a practice piece, though I think the end result will be pretty lovely! 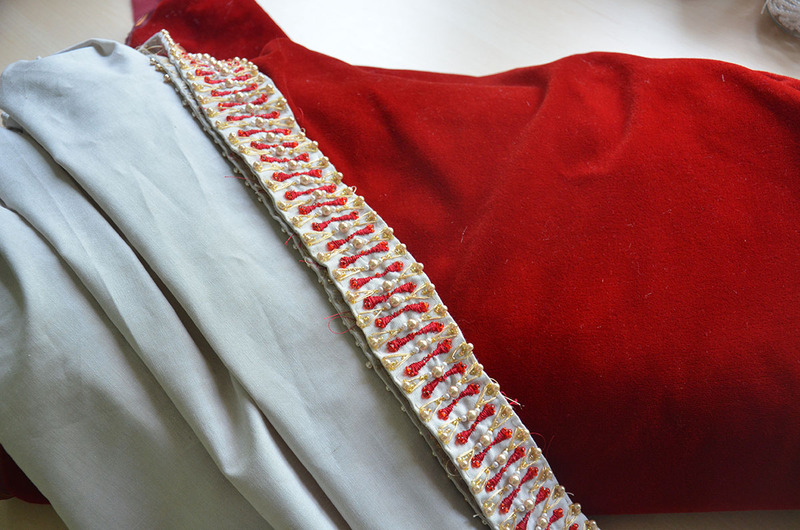 So far everything is drafted and the skirt is sewn, hemmed, and decorated with the trim. Now for a future project – which I shouldn’t even be thinking about with all I have in progress. Michaels was having a 40% off sale and I bought 40some sprigs of flowers, which is around 200 blossoms in total! I want to add these to the hem of a dress, and make a corseted bodice from tulle and organza. I’m honestly not sure it’s possible, but I would really like to try. So that’s that! Lot’s of stuff in the works. You have a lot going on! 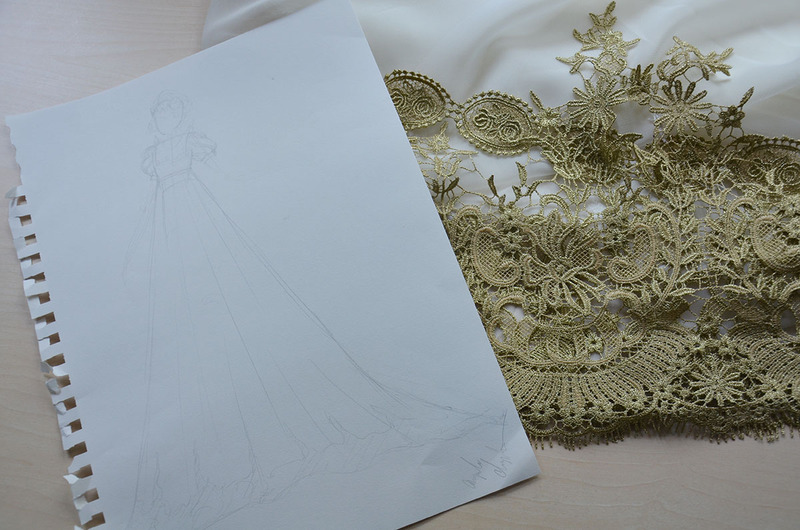 That tulle and lace wedding gown is going to be gorgeous! I’d love to see how different the dewdrop dress looks with the pocket hoops. I love the idea of a dress with flowers all over it. From experience though, be gentle with the blossoms as they start to fray with handling. I look forward to seeing the end results of all of these! 😀 I know they will be wonderful!